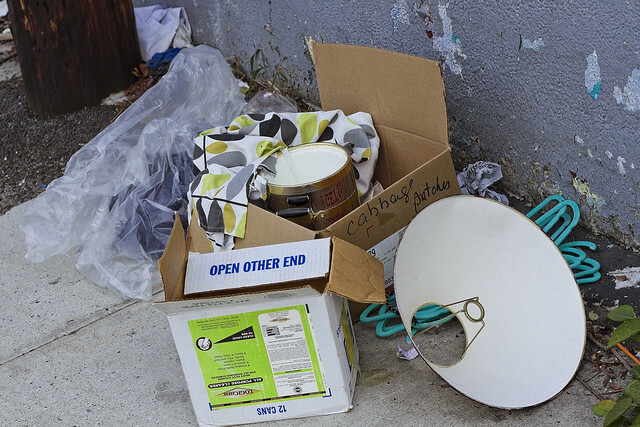 The native art form of Queens, illegal dumping, in today’s post. Often has a humble narrator commented on the panache and style in which the neighbors hereabout dispose of unwanted items. Sure, you’ve got illegal dumping in Brooklyn and the Bronx, and on the islands of Staten and Manhattan, but nowhere else in the City of Greater New York will you find the compositional flare and post modern sensibility of the Queensican who is trying to dispose of an unwanted item in a clandestine manner. In Queens, people still care about how their middens look – so go ahead and call us old fashioned! There’s a few items which the redoubtable Department of Sanitation either won’t take due to regulatory rules, or due to improper packaging of the refuse for collection. 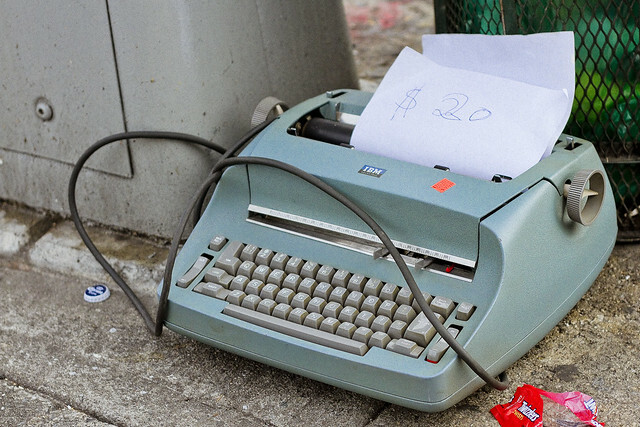 None of the items in the shot above are proscribed, to my knowledge, but that doesn’t mean a thing to the Woodside artisan who arranged them on a sidewalk beneath the NY Connecting Railroad tracks recently. Here in Queens, freedom of expression is sacrosanct. Disingenuously, or casually, arranged sidewalk litter? Not in my back yard, thank you. Just the other night, as I watched a lady empty her vehicle of what must have been a full case of empty beverage bottles into the street in front of my own domicile, and the utter joy of her explorative compositional process nearly overwhelmed me. Calling down to her – I assured her that we local residents would be happy to take care of her installation, post facto, and thanked her for choosing my block for her canvas. It’s important to acknowledge the artist as they pursue their work rather than after they’re gone. There is a syncopated flair, a level of deep improvisational thought – a rythmic irony that’s at work in the expression of the native born art form of Queens, as encountered here and there. You don’t just open the door of a contractors van and push debris out in the same manner you would in Brooklyn. I’m Queens… we hold a higher standard, and our illegal dumping was “artisanal” long before Brooklyn appropriated the word. 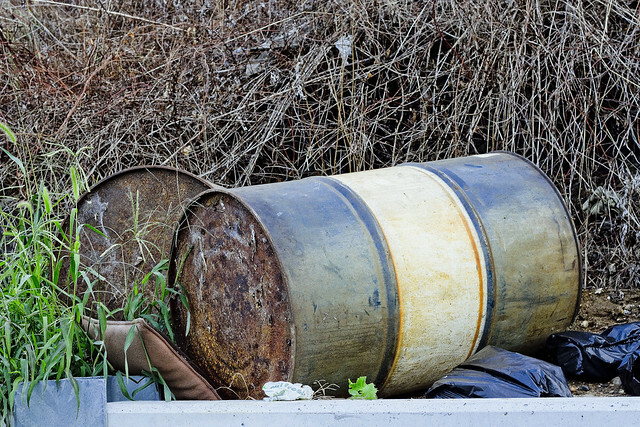 In many ways, illegal dumping in Queens is reminiscent of 1950’s era Jazz. Think Mingo, and Monk. Always the Charming Revanchist (or should I say recidivist). How, in a zeitgeist of non-judgmentalism, in the prevailing state religion of post-modern gnosticism, is this type of dysfunctional behavior surprising? The progressive cult celebrates dysfunction after all. Get with the program, yo, and celebrate this vibrant diversity and cheer this creative destruction according to our masters’ wishes. But wait, does the Kool Aid taste a little of bitter almond? Oh, well, this be the will of our masters. Nothing to be done about it. So I’d just write this off as a foolish peasant forgetting their place in believing they have the right to disobey the laws as do our glorious sovereigns, our city, state and federal betters, but not at all surprising. And how, by the way, is it that a Canarsieling should have the cheek to create his own neologism to lump together the various townspeople of this county into a non-historical monocultural mass? Vini, vidi, vici? Such things should be more properly left to we who are multi-generational natives and thus I prefer to use the word “douchebags” in the aforementioned context.